A massive solar eruption, called a coronal mass ejection, can be seen blasting out from the sun's surface after powerful X1.6-class solar flare on Sept. 10, 2014. The joint NASA-European Solar and Heliospheric Observatory captured this view of the eruption, which was aimed at Earth. Two waves of solar material blown out by powerful sun eruptions n this week are hitting the Earth now, and could amplify the aurora displays for observers in northern regions. Scientists with NOAA's Space Weather Prediction Center in Boulder, Colorado, expected the first wave of solar flare particles — unleashed by a so-called coronal mass ejection, or CME, on Monday (Sept. 8) — to reach Earth Thursday night (Sept. 11). A second wave, this one caused by a massive solar flare on Wednesday, is due to arrive between Friday and early Saturday. The enhanced auroras would likely be most visible across the northern tier U.S. states, along the U.S.-Canada border, as well as in New England, added SWPC program coordinator William Murtagh. Clear, dark skies far from city light pollution are vital to observe any auroras. The first of the two solar storm waves reached Earth late Thursday right on time, space weather center officials wrote in an update late Thursday. Also on Thursday, NASA released a new video of the X1.6 solar flare from its sun-watching Solar Dynamics Observatory, showing the event in two different wavelengths. Coronal mass ejections are powerful eruptions of super-hot plasma than can be blown out from the sun during major solar flares. This week, the an active sunspot known as AR2158 sun fired off a moderate M4.6 solar flare on Monday, followed by a much more powerful X1.6-class flare on Wednesday, Sept. 10. X-class flares are the most powerful flares the sun experiences. Sunspot AR2158 is about the size of between 10 and 20 Earths, but appears to be in the process of breaking up, Berger said. The huge X1.6 solar flare may have been its swan song as it breaks down, he added. This NASA image shows the active sunspot AR2158, which unleashed a massive X1.6 solar flare on Sept. 10, 2014, as it appeared on Sept. 8, when it fired off a moderate M4.6 solar flare. On the right, Jupiter and Earth are superimposed to give a sense of the sunspot's size. 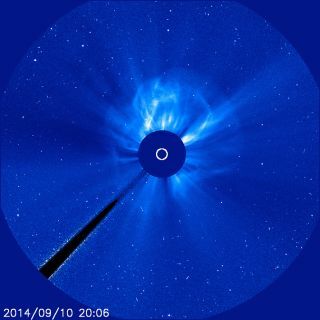 The two solar flares this week were accompanied by coronal mass ejections, and both were aimed at Earth. When directly aimed at Earth, the most powerful solar flares — events stronger than the X1.6 storm on Wednesday — can pose a danger to satellites and astronauts in space, and interfere with communication, navigation and even power distribution surfaces on the Earth's surface. Berger said that the two CMEs from this week's solar storms could cause some radio and GPS navigation system hiccups, as well as voltage irregularities in power grids of the northern United States, but nothing too extreme. "We don't expect any unmanageable impacts to national infrastructure from these solar events at this time, but we are watching these events closely," Berger said. The huge X1.6-class solar flare is seen erupting from the sun in this three-wavelength composite image captured by NASA's Solar Dynamics Obervatory on Sept. 10, 2014. The solar flare occurred at 1:45 p.m. ET. Berger did say that it is fairly rare for two significant coronal mass ejections to hit Earth head-on at nearly the same time. A minor radiation storm was detected from the solar flares, as well as temporary radio blackouts, space weather officials said. Space weather officials did say that the most intriguing aspect of this week's solar flares are their potential for boosting this weekend's northern lights displays. When charged particles from solar storms reach Earth, they are funneled to the polar regions by the planet's magnetic field and can great so-called geomagnetic storms. A minor G1-class storm is underway now, with levels expected to rise to a potentially strong G3-class by Saturday evening, Berger said. When solar particles collide with the Earth's upper atmosphere, they let create a glow that can be visible from the ground as auroral light. In the northern regions of Earth, this glow is known as the aurora borealis, or northern lights. In the south, it is called the aurora australis, or southern lights. Significant solar flares can amplify those displays into dazzling dances of ethereal light. Editor's note:If you capture an amazing photo of the northern lights this weekend and would like to share the images with Space.com, you can send photos and comments in to managing editor Tariq Malik at spacephotos@space.com.